Subscription via Autodesk App Store allows you to license SOFiSTiK BIM Products on a term basis to meet a variety of business needs and budget considerations. Annual subscriptions offer cost savings for long-term software needs and monthly subscriptions are a short-term option for project-based work. Visit the SOFiSTiK Publisher Page to view the products available via subscription. Click on a product to see prices for monthly and annual subscription contracts. The licenses of the software subscribed via Autodesk App Store as well as the 30 days trial license are connected to your Autodesk account you’ve been logged into the App Store. Use the Sign In tool of the Info Center at the top of the Revit window. Open a project and start working. Make sure to login with the same Autodesk account you have subscribed the app or started the download of the free trial. 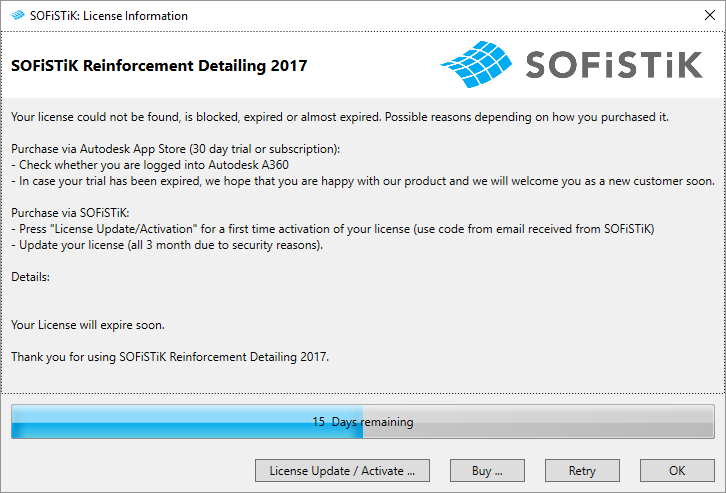 If your license could not be allocated for any reason the SOFiSTiK license dialog displays. Check the issues in the dialog and go to the Need Assistance chapter for help.